CALTECH/JOHNS HOPKINS (US) — New technology has allowed scientists to take the first measurements of sand dunes and ripples moving across the surface of Mars. Last year, images from NASA’s Mars Reconnaissance Orbiter captured the activity on Mars’ surface—observations that challenged previously held beliefs that there was not a lot of movement on the red planet’s surface. The new method for data processing is outlined in an advance online publication of the journal Nature. “For many years, researchers have debated whether or not the sand dunes we see on Mars are fossil features related to past climate, since it was believed that the current atmosphere is too thin to produce winds that could move sand,” says Jean-Philippe Avouac, professor of geology at California Institute of Technology (Caltech), who initiated the study. 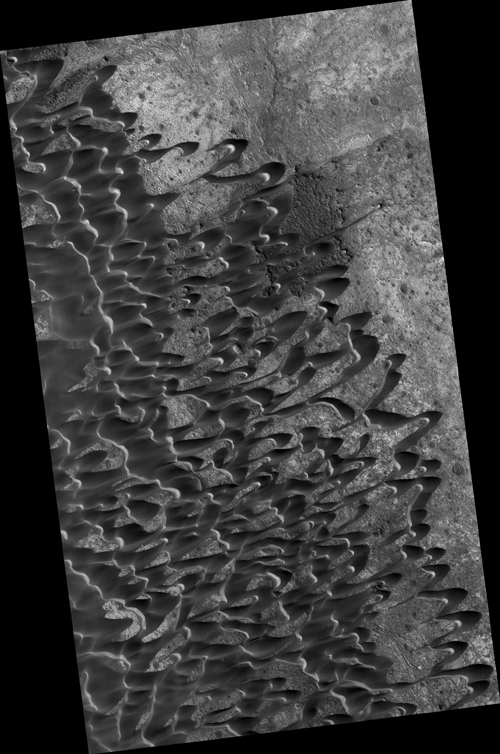 Using the COSI-corr software (for Co-registration of Optically Sensed Images and Correlation), which was invented at Caltech, a team of researchers gathered high-resolution imagery from Mars to look at a specific field of sand dunes called Nili Patera. The images came from the High Resolution Imaging Science Experiment (HiRISE) on the Mars Reconnaissance Orbiter. The team focused on precise, subpixel measurements of movement between pairs of images. On the dunes at Nili Patera, the software automatically measured changes in the position of sand ripples from one image to another over a 105-day period, resulting in the surprising findings that the ripples aremoving fast—some upwards of 4.5 meters during that time—which contributes to the total motion of the sand dunes. “This is the first time that we have full, quantitative measurement of an entire dune field on a planetary surface, as opposed to the localized manual measurements that were done before,” explains Francois Ayoub, a coauthor of the paper and a scientist engineer in Avouac’s lab. “We chose Nili Patera because we knew there was sand motion going on there, and we could quantify it,” says Nathan Bridges, a planetary scientist at Johns Hopkins University Applied Physics Laboratory and lead author of the paper. “The Nili dunes also are similar to dunes in places like Antarctica and to other locations on Mars,” says Bridges. This implies that the rates of landscape modification due to wind are similar on the two planets. Interestingly enough, getting these measurements was much easier on Mars—the researchers could not quantify dune ripple migration rates on Earth using the same technique because that would require satellite imagery of our planet at a resolution that makes it classified information. “These new measurements provide keys to interpreting the landscape and the stratigraphic record that you see exhumed when you look at the imagery—we see sediments and wonder what they mean in terms of the past geologic history,” says Avouac. Next, the team will focus on learning more about how the sand is actually moving on the surface of Mars. “We would like to use this new data to tie our observations to the physics of sand transport, which are not well understood,” says Sebastien Leprince, a coauthor of the study and a senior research scientist on Avouac’s team. The group also plans to use the HiRISE images paired with COSI-Corr to explore other regions of Mars and monitor for surface motion. For example, there are parts of the planet that may have glaciers covered with dust, and other places where fault lines can be seen and could be tracked for displacement. “We are going to visit other areas on Mars to get a better view of what kind of activity there is on the planet today—geologically speaking, of course,” says Avouac, who points out that while they are not looking for life on Mars, their technique is detailed enough that it would detect very small changes on the surface. The study was funded by grants from the Keck Institute for Space Studies at Caltech, NASA’s Mars Data Analysis Program, and the Jet Propulsion Laboratory’s Director’s Research and Development Fund. Additional authors of the study are Antoine Lucas, a postdoctoral scholar in planetaryscience at Caltech, and Sarah Mattson from the University of Arizona. An exclusive license to Caltech’s COSI-Corr technology was recently awarded to Imagin’Labs Corporation.